In May 1954 Shlomo attended the bar mitzvah of John Strasberg, the son of Lee Strasberg, a prominent acting teacher who specialized in “method acting” where the actors create in themselves the thoughts and feelings of their characters, so as to develop real lifelike performances. Many of Strasberg’s students were present and one of them announced that he is planning to produce the famous play The Dybbuk and he is looking for a real Hasid who can demonstrate the inner life of Hasidim, how they walk, talk and feel. Shlomo, at the time 29 years old, had recently received rabbinic ordination and was closely affiliated with Habad. He was hired for the advisory role. Thus, for half a year “almost every day”, Shlomo would go to Greenwich Village, the Bohemian center in Manhattan. He would also take the actors, some of whom were not Jewish, to visit Hasidic events. Then they would sit and talk. One of the actors who strummed on the guitar would accompany Shlomo’s singing. Shlomo was so impressed by the guitar player who was using just two musical chords that he decided to learn guitar. The Dybbuk, for which Shlomo is listed as an advisor, played in 103 performances from Oct. 26, 1954 – Jan. 23, 1955 at the Fourth Street Theatre, 83 E. 4th St. in Manhattan. When I was learning how to play the guitar, my guitar teacher told me there was an old tradition that some Flamenco tunes went all the way back to the Temple. She said there were some old music manuscripts of flamenco with the signature Reuven Halevi. Dorothy is about twenty miles west of Atlantic City. There Shlomo met and befriended Nina Simone who sang and played piano at the Midtown Bar and Grill on Pacific Avenue in Atlantic City. The two encouraged each other to develop their singing careers at a crucial point in their development. Nina introduced Shlomo to Harlem Gospel music. She produced her first album, Little Girl Blue, in 1958. It was a smash hit and she went on to record more than forty albums. An album of Simone which appeared in 1962 contained the song “Sinner Man,” an American spiritual telling the sinner not to run from God. Shlomo adopted this song for his own performances early in his career. Anita Sheer (1935–1996) was a student of Carlos Montoya (1903–1993), a founder of the flamenco style of music and dance. Anita developed a career in folk music and appeared on stage with singers such as Bob Dylan and Pete Seeger and may have been instrumental in introducing Shlomo to them. She wrote the book Flamenco Guitar Method for Beginners, see TheFlamencoSociety.org, www.theflamencosociety.org/id19.html; http://www.finefretted.com/html/desde_el_escritorio_sept__5__1.html. This is the quote as remembered by Rabbi Moshe Stepansky (personal communication, Aug. 26, 2012). 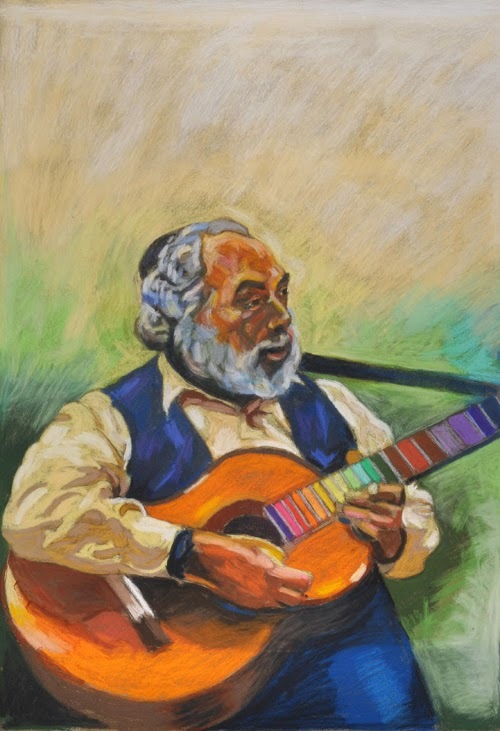 He was gabbai of the Carlebach Shul from 1987–2002, and today lives in Safed. Adapted from Witt, “Reb Shlomo 1980,” 4; Witt, Open Gates of the Heart, 220. Nina Simone was the stage name of Eunice Kathleen Waymon, singer, songwriter, pianist, arranger, and civil rights activist associated with jazz music (1933–2003).